Leapsters at $30 at Walmart, and I needed TWO of them. That's $40 in savings. My plan was to just get up, not even shower, mosey the twenty minutes into town, sweep in, and pick them up, and be back within the hour. Leapsters are so last year. No one was going to want them. I was about to go home when I spotted a Leapster in a cart, waiting to be reshelved. I grabbed it. While I was chatting up the cashier about needing two, but one would do, she pulled over a restocker person who had one more in their cart! Now, I say "new" loosely. It is brand new, but I have flipped through it. 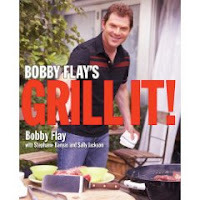 Grilling just isn't my thing, but it might be your thing. So if you would like to enter to win my flipped-through copy, please just leave me a comment! I'll announce winners sometime Saturday or Sunday! There is nothing like the smell of gingerbread to make your home smell like Christmas. I like to make these in the morning before I start pulling out the Christmas decorations. 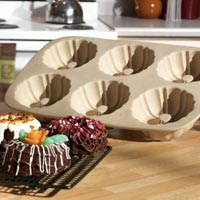 Line or grease 12 muffin cups. Blend applesauce, oil, brown sugar, and egg. Stir in flour, baking powder, salt, ginger, 1 1/2 tsp. cinnamon, and cloves. Beat until just combined. Spoon batter into liners, filling 1/2 way. Spoon 1/2 tsp. of jam on top of each. Cover with remaining batter. In small bowl, combine the 1/2 tsp. cinnamon and 2 Tb. sugar. Sprinkle 1/2 tsp. on top of each muffin. Bake at 350 degrees for 35 minutes. Let cool in the pan for 5 minutes. Not far from where I grew up is Cranberry Glades. When we were in school, we often went on field trips here to study this natural wonder. This is what I learned from all those field trips. At some point doing the past, glaciers from the north made their way to little ol' West Virginia. When the glaciers began to recede, the elevation of this certain place and the little "bowl" created by several mountains, left some glacier intact for several more years. When it melted, it left behind seeds native to a more northern climate. Since this little "bowl" is still protected by the mountains, there is now a bog with plants not normally suited to West Virginia, like cranberries. The National Forest Service has built a half-mile boardwalk over the area so that you can walk through the bog without disturbing the plants. It's a beautiful walk at any time of the year. The cranberries are not harvested commercially. So even though you may not see West Virginia-grown cranberries in your grocery store, you can still enjoy this recipe with fresh cranberries found in grocery stores at this time of the year. Stir together cranberries and 2 Tb. sugar in a small bowl. Combine the 2 cups of flour, baking soda, oats, 1/2 c. sugar, and brown sugar. Stir in melted butter until crumbly. Reserve 1 cup of this mixture for later. Press remaining crumb mixture into the bottom of a lightly greased 9 x 13 pan. Bake at 350 degrees for 15 minutes. Then, sprinkle dates, pecans, and cranberries on top. Stir together caramel sauce and 1/3 c. all-purpose flour together. Spoon over cranberries. Sprinkle the remaining reserved crumb mixture on top. Bake 20 minutes more or until lightly browned. Cool on a wire rack. Makes 2 dozen. We were home yesterday with a snow day. Because Frack wasn't feeling well, we cuddled and watched some Noggin. I have to admit that at first that I was repulsed by Yo Gabba Gabba. Now, I have become a little fan. It's cute. My kids love it. It has groovy tunes. I'm only a little fan, because I can only watch it in little periods. I've seen this episode with Elijah Wood. I even danced the Puppet Master in the living room. I must say that this music pumps it up. Enjoy. Our first snow day of the year! We are in a winter storm warning until midnight tonight. We are expected to get up to a foot of snow! Bring it on! Frick and Frack are playing with play-doh in the kitchen, while I make Pumpkin Pie Squares from My Sisters' Cucina. 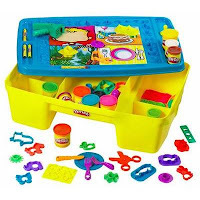 My kids will play with play-doh for hours. This was one of last year's Christmas presents. It was worth the money. We have a fresh new batch of Play-doh from Trick-or-Treating at school. Normally, we make our own. If you find yourself with an unexpected snow day, you can make your children some fun. Today was weigh-in day for our little weight loss group. Two pounds, baby! That brings my total to nine pounds! To motivate myself, I have picked out my twenty pound goal - a dress from Shabby Apple. I can't make up my mind. It will probably be which ever one is on sale. I love wearing dresses, but it is difficult to find dresses that are flattering (and modest) without making me look like the frumpy schoolmarm that I am. Here's a family-friendly dinner that's easy to make in one pan. It simmers quietly giving you time to putter around the kitchen doing other things. It's almost time for holiday parties! My mama taught me to never show up empty-handed. Usually, that means that I make something to take. But with working full-time, it is hard to have something ready to go all the time. are a must for the holidays. Most of the mixes need only an 8-ounce cream cheese and 2 tablespoons of butter. The toppings for the cheese ball is included. There are also recipes on the box to make more elaborate appetizers or desserts. These also make excellent hostess gifts. Pair one of these mixes with a cute little serving plate and tie with a bow. You can't go wrong. When I get back on the weight-loss wagon, I always struggle with what to pack for lunch. I have eaten my weight in Lean Cuisines. After time, the Lean Cuisines begin to taste like carboard with sauce. I love this recipe because I can make it for dinner and eat it for a couple of days for lunch. I just keep everything is small, separate bowls until I am ready to assemble it at lunch. Combine the first three ingredients in small bowl. Combine chicken and barbecue sauce in a microwave-safe bowl. Microwave at high for 1 minute or until heated. Divide chicken mixture among tortillas; top with slaw. Roll up tortillas. 4 servings. I am not a big gadget fan. However, I do have a salad spinner. I love my salad spinner. 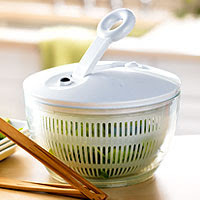 I eat salad just so I can pull out the salad spinner. It is mesmerizing to watch the salad whirl around. And then, to see the water that comes off of it - and to see the color of the water. Ugh. Try it sometime with bagged salad. That prewashed stuff has a lot of dirt on it. I no longer buy salads in the bags. My salad spinner came with a berry bowl that is great for gently spinning the water off berries. So why would you need a salad spinner? It makes your lettuce so much crisper. You know how you eat salad out at a restaurant and you wonder why your salads don't taste like that at home? It's the spinner. Dry lettuce is crisp lettuce. You can use a clean pillowcase with the same effect. Just make sure to do this outside. Some ladies that I work with tried to get a person to come and lead a WW meeting at school. Right now, my only option is WW online, and that is not going so well. I really need the probing eyes of a weigh-in person to keep me motivated. Because we work in Podunk, no one was willing to come and help us lose weight. One lady has organized a weekly weigh-in meeting at school. Yesterday was the first day. Really. I needed to go to the grocery store. Farmer Brown was available to keep Frick and Frack. Going to the grocery store without kids is a miracle you can't pass up. I really don't like rushing the holiday season, but I couldn't leave those there. In our small town, if you see something at Walmart, you'd better get it then. Without any competition, everyone shops there. Gingerbread Pop-tarts with frosting filling. I ate one in the car on the way home. I then decided that they would be much better in the toaster. I was right. I did have to share that one with the kids. 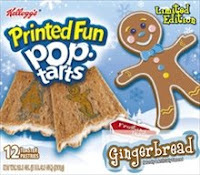 5 points WW per Pop-tart. They were good but not really worth those points. I do, however have a whole box left and a whole week until weigh-in. First of all, my camera has bit the dust. Not that it was a great camera as my older posts can attest, but it was my camera. I am now in the market for a great camera on a low budget. Any suggestions would be welcome. As a teacher, I am thankful that they use the schools for polling places. My guilty mom voice only scolded me once for sending the children to preschool while I stayed home and tried new recipes. I was in a mini kind of mood. I made Mini-Chocolate Pumpkin Cakes with Cream Cheese Frosting and Mini-Almond Coconut Cheesecakes. The recipe for Chocolate Pumpkin Cakes came from Country Living. My friend's birthday was today and I wanted a little something to send to her. I made the recipe and used my Pampered Chef mini fluted pan. It made six perfect little cakes that popped right out. This recipe is a little more involved than I usually make. But with the children away and the extra time, it was relaxing to concentrate on a cake truly from scratch. I frosted the cakes and placed them on little plates. I wrapped each one with parchment paper and tied them with a pretty ribbon. If I had my camera, I would have taken a picture to share the love with you. Beat 6 oz. softened cream cheese using a mixer on medium speed until fluffy. Add 1 1/2 c. of confectioners' sugar, 2 1/4 tsp. cocoa, 1/4 tsp. cinnamon, and 3/4 tsp. vanilla and beat until well combined on low speed. In a separate bowl, beat 1 1/2 c. heavy cream with 3/4 c. confectioners' sugar on medium-high speed to soft peaks. Gently fold the whipped cream into the cream cheese mixture until well combined. Two years into our marriage, I had a new recipe to make that called for a Bundt pan. I didn't own a Bundt pan. When I called my in-laws house to ask to borrow one, my father-in-law answered. He said, "Honey, as much as you bake, you don't own a Bundt pan?" I figured he really didn't know what a Bundt pan was. Two hours later, he arrived at my house with my very own, brand-new Bundt pan. Navy blue. He went to Walmart and asked around until he found me the best that Walmart carried. Every time I use my Bundt pan, I think of my father-in-law and his graciousness to me. And not only to me. He will do anything for anyone at anytime. There are things that you hope to give to your children. I hope to give his selflessness to them. To you, I give this Bundt cake recipe to make and share with someone else. If you don't have a Bundt pan, you can call my father-in-law. I'm sure he'll deliver you one, too. In medium bowl, combine pumpkin and cinnamon. In large bowl, combine cake mix, eggs, sour cream, sugar, oil, and water. Beat on low speed until moistened. Beat on high speed for 2 minutes. Stir 2 1/2 cups batter into pumpkin mix. Alternately spoon plain and pumpkin batter into greased Bundt pan. Bake 375 degrees for 40 - 45 minutes. Cool in pan for 2o minutes. Remove to wire rack to cool. Combine sugar, flour, and salt in a saucepan. Stir in water and butter. Cook over medium heat until mix comes to a boil. Boil for three minutes, stirring constantly. Remove from heat. Stir in vanilla. Drizzle over cake. Lesser Evil has the best little website. You can even enter to win a "Snackcident Prevention Kit". They have other products. Wheeee! I must get some Krinkle Sticks.